In my second year of this new career. Formerly ran restaurants for Red Lobster and TGIFridays. I currently drive for JB Hunt in their Dedicated Contract Services division. I drive from Lansing Michigan to all over Chicagoland from Saturday through Wednesday nights. Yes indeed Guy! After doing team driving for 15 months or so, I wanted to go solo and see if that was going to pay the bills any better. There are definite pros and cons to both ways. I'm a bit of a loner and have pretty eclectic tastes in music. Solo affords me the opportunity to listen to whatever as loud as I want. I find myself doing a little seat dancing much to the amusement of the vehicles passing me by...lol. If I can ever talk my bride of 28 years into hitting the road, she would be my ideal team driving partner. I have built up $100 worth of points at TA/Petro and want to get a Bluetooth headset to be able to legally talk to whoever during my shift. Can anybody give me an idea if there are any worth purchasing at TA/Petro? Just completed my 7th full week with my new company. My slowest week was 2495 and my busiest is 2710. At 40 cpm , I ( my wife even more) am very happy with the consistent miles and pay. It's out there, just have to find it. This place is aggressively seeking more drivers....fyi. Woot!!! Passed CDL test today! Congrats and welcome to the CDL holders club...let the real education begin. Enjoy the adventure! I learned double clutching from the beginning. I still use the method and it is completely second nature to me now. 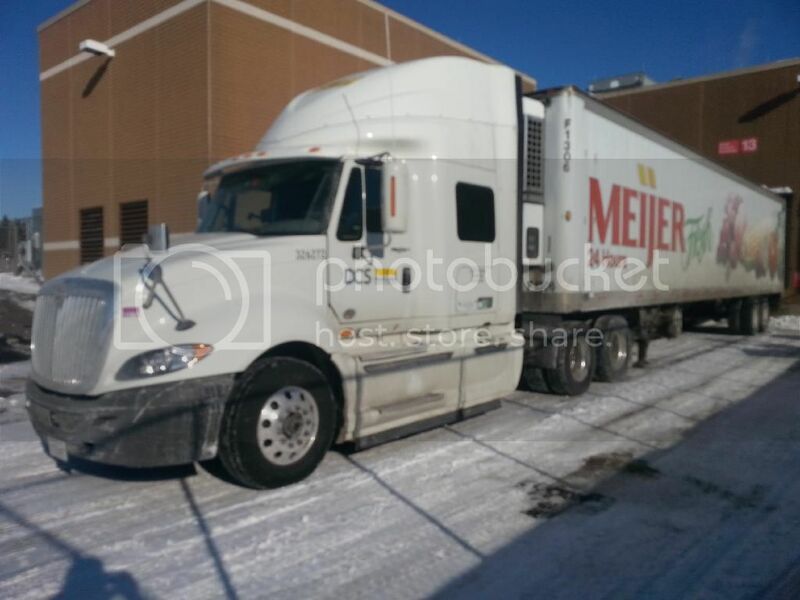 When I joined my current company, I went out with a veteran driver for one night just to get the details and practices (paperwork, where the trailers are found, where the backhauls go when we get back, etc..), he was a gear floater. I watched him and it looks effortless and easy. I tried it a few times the next night in my own truck and it felt so foreign to me, I just went back to what felt right, double -clutching. Every driver will use the method that suits them best. On a side note, with the increased city driving I now do, I am walking lop-sided because my left (clutch) leg is so much bigger and stronger than the other...lol. There we go Anchorman!!! That is awesome! Thanks for the pic. forgot to add the pic...captured this beauty at the Flying J in Houston last autumn! My dream truck is a NASCAR Hauler. 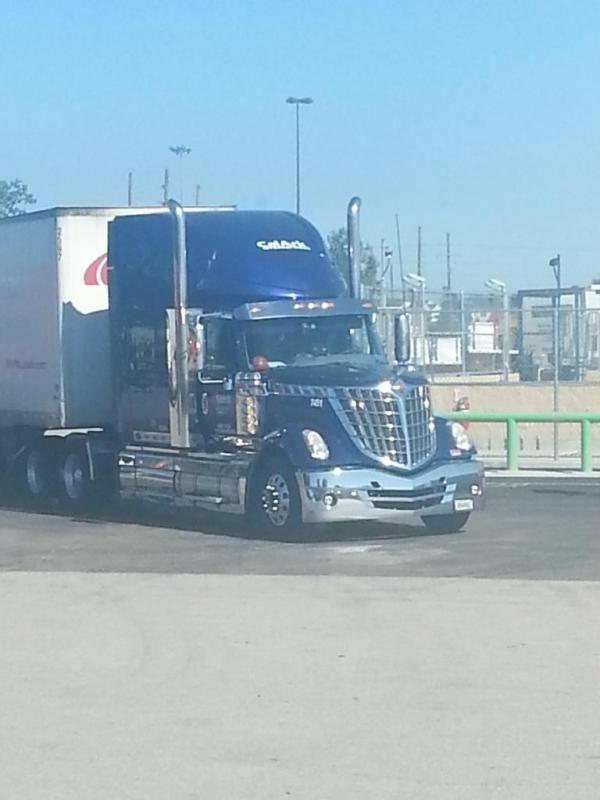 My realistic dream truck though is right at the top of the page here at TruckingTruth. International LoneStar...I love the design and looks of that model. Wow! I agree with Chief...Hazmat first! I have both and have used my Hazmat a lot. It opens you up to more loads which usually means more miles. There is almost always a premium for hazmat miles. I have been carrying a TWIC card from the beginning but haven't needed it yet. Check with your dispatcher/company as some will pay for your fingerprints for your Hazmat endorsement. 1. Home time- my wife would rather see me for 2 days every two weeks than four in a row after four weeks. 2. Money - even though I am making double today what I was making in the first few months, the offer from JB Hunt seems to be significantly higher pay. The offer is for a regional job ( 6 states in the Midwest ) and home every other weekend. I know better than to believe most of what a recruiter tells me...so I thought I would see if there are any others here that could tell me if JB Hunt is worth the move. Our trucks come with a fridge and a CB antenna. There is ample storage space. I have added satellite radio (I would lose the fridge before I drive without my satellite radio. ..lol). I also have added GPS, CB, and a crockpot. Pretty spartan...but we don't sit much as a team so it works out pretty well. CRST is indeed team driving almost exclusively. My driving partner and I have been getting 22000 - 25000 miles in a 4 week month out. We have Hazmat and seem to be moving under load all the time. We have a terrific dispatcher. I did almost all my research regarding starting companies here and was well prepared for all that I experienced from day one. It is absolutely forbidden here at CRST. Call your safety department and they will have your back. If they like your trainer you may get moved but your status with the company will be ok. If it isn't. ..find another company. Riding up there is almost always a fatal mistake in an accident. I can answer CRST specific questions. The info on this website is spot on though. I went to a CRST approved school in Michigan.I was very prepared for the whole process based on everything I learned on TruckingTruth! I was very wary of the team concept. ..I like being alone or with family. I talked with a few current team drivers about how they liked it. The biggest and best advice I got from that was to find your partner during school or orientation. ..you will have more of an opportunity to determine if you want to spend a LOT of time with him/her. My co-driver fight like an old married couple but we get over it pretty quick and continue to work for our common good. Yes with CRST you can take the truck home. They only want to know where it is and that it is secure. It's been a while since I posted last. I went to Springfield last October to start with Prime. Unfortunately , I was sent home to get a medical issue cleared up and documented. It would have taken me several months of specialists visits to get everything they needed. I couldn't wait that long so I went with my second choice....CRST. They put me in a school only fifty miles from home so I was able to do that and finish up medical. The med issue was too minor for CRST to be concerned about. I completed school and received my CDL in early January and after a day to celebrate with my wife it was off to Cedar Rapids during the coldest week of the year for orientation. Made it through that process and was assigned a trainer. After driving for 10 hours in a rental car to OKC... I climbed aboard the trainers truck for my 28 days of training. Thanks to all the advice on here , I expected to be challenged and I was definitely not disappointed there. It was a harrowing trial by fire...but I am a better driver for it. I am just beginning my second month on the road after training and I am loving it so far. Every trip is a new challenge and we keep piling up miles. If any of you want to know more about CRST...let me know. I am not a cheerleader, but I am not a hater either.